Magica Goldens: The new pool is installed! 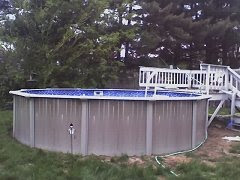 The new pool is installed! I woke up Christmas morning of 2007 and noticed my yard was flooded - too much ice in the bottom of the pool to know why - but it was pretty clear that the old pool liner - who had been so faithful for so many years had finally "had it". When spring came and the damage (and I mean damage) became apparent the bottom of the liner was just shredded in so many places - it wasn't just ugly - it was bad. So I placed some calls around town and had a couple of folks come out and look at the pool and give me an estimate for replacing the liner. No dice, there was rust on the inside of the pool wall that weakened the sides for one and if the walls were to give way the liner would burst at that place too and everything in the pool would be sucked out a jagged metal hole. No thanks, I'd prefer not to be mangled while swimming - if only because I'd be really embarassed to have the ambulance come "save" me in my bathing suit (gasp). Plus I'd be paranoid about the dogs in the pool and we all know that they have intrinsic value above my own self-worth. In other words the dogs come first and they really enjoy their daily swimmies. It turns out that the original pool was about 20-25 years old - probably the original liner. I've lived there almost 10 years and the dogs and I have beaten that liner to death and defineatly gotten use out of it. So I priced a few vendors around here - most of them were really pricey and/or tried to sell me something bigger and better than I had originally had - but I wasn't (and I'm not) going to replace my deck this year too - baby steps to avoid bankruptcy and that means one thing at a time and already this spring we've already replaced the fridge ($$$), had a sick cat ($$$$), had our property taxes nearly double ($$$$), owed income tax ($$$) after we'd already planned and entered quite a few spring shows ($$$$). So baby steps to solvency. I don't often plug businesses here, but on a whim I called Avalon pools in Milton and spoke with Pam (one of the owners) - I'd never been there before as it's out of my way and I generally go a little bit closer to home for my chemicals. Well not only did Pam price what I asked for and not try to upsell something I didn't need or want, she gave me a great deal on a pool kit and liner (and I love the new liner) and they install their own pools. 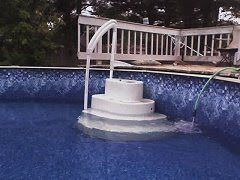 All of the other guys use contractors to install their pools and then take a cut from the referrals. If I'm going to use a contractor to install the pool I might as well just buy a really cheap kit off the internet and be done with it. Long story short I went with the Avalon pool and it's awesome - it's gorgeous, the install team took down the old pool stacked it neatly where I asked them to put it, they were polite and helpful while they put up the pool, they did a fantastic install job, left me all the pieces and I didn't have to hunt for anything - and went above and beyond to prepare a "shelf" for my wedding cake stairs (the dog stairs) so that they sit properly on the bottom without needing to be propped up on sand bags like the way they were installed before. 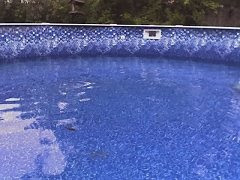 So if anyone out in blog land needs a pool, call Avalon in Milton - good folks!